I quote it often, but it’s hard to go past. Umberto Eco – initially in reference to his inversion of the detective novel The Name of the Rose – suggested that explaining a novel should be the work of a reader, not an author. Who could possibly contain the interpretation of a work of fiction in a single definition? It seems absurd. It’s the text-as-formula method of reading (and teaching) fiction that suggests there is always an answer to the question What does it mean? and it’s in the back of the book. I wanted to wait to write on Annihilation. I think it’s the kind of film that rewards that. 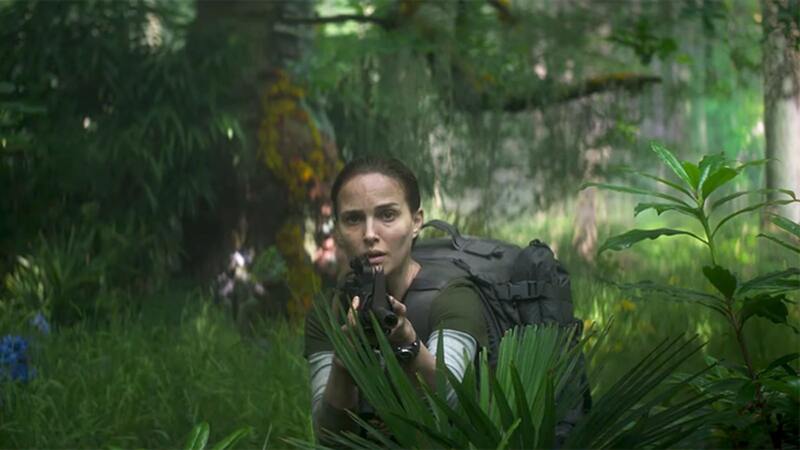 And even though it’s rare to find genre film these days that wants to push beyond the confines of accessibility, Annihilation is no Tarkovskyian dream. Its narrative is linear, its questions articulated with clarity. Perhaps it’s a sign of how much audience expectation has been catered to in the last decade of mainstream cinema that Annihilation can cause such a stir over such a small release. But the film: itself a reader’s interpretation of a narrator’s work – Alex Garland doesn’t necessarily adapt the novel as turn it into a palimpsest (again a feature of Eco’s writing), and his process is akin to the text of the film itself. Creations are broken down, distorted, changed, and made into something new. So for me, my reading is itself as much an interpretation of an interpretation. Reading stories are not halls of mirrors, but prisms. Every reflection refracts, begets something new, something scattered and dispersed. Much could be made about how the film is itself a discussion of artistic creation (and the destruction that comes with that process) but that’s not quite where I landed. It’s not artistic creation for me, but creation entire. Not for nothing is Area X a garden. The dancer laments the limitations of their own physical form. They cannot move the way the marionettes do. Most importantly, the marionettes have no affectation. They are not burdened by a soul that would alter its intent, its movements, its form and function. Our humanity gets in the way. The film begins, we see something burning up on entry to Earth’s atmosphere. It crashes near the lighthouse, and something begins to grow. It is almost a creation story, our creation story, if we divide our time the way children do, knowing that before us were the dinosaurs, and then they died, and then we came. Finding the world empty, yet existing. Our own Area X, our own Eden. When Lena first sees it, she faces the Shimmer – an oil slick curtain drawn around a forbidden garden. God makes mistakes, Lena remembers. The Shimmer is growing closer, says Ventress, with a sense of despair. It’s a simple choice for her: destruction there or destruction here. At least there she’ll know. This sense of immediate doom hangs over the film, the feeling that humanity has stretched itself past a point. We’ve gone too far, we’ve made mistakes (or we are mistakes) and the life outside of Area X has no hope, no reason. Painting our bedroom is distraction, not progress. Going back home is not safer than going forward into the Shimmer. As they journey through Area X, Lena describes the mutations as starting subtle, then growing in variety and significance. The flowers, the crocodile with shark teeth, blossom-horned deer – they can be mutations. But as the tattoo forming on Lena’s arm suggests: endings are beginnings. Life is infinite, even if it isn’t our life, or doesn’t even include us. These mutations can be seen as something changing and destroying the life that pre-existed, malignant tumours, or as new life. Something with a new point of origin. This much comes home when Lena does, at the terrifying midpoint of the film. The four remaining in the group hole up in a house that is literally a refraction of Lena’s house back in the suburbs, complete with absent husband. Only here, the past is present. Lena’s mutations – her infidelity, her lies to her husband – are levelled at her through Anya, only this isn’t about atonement, this is about beginning. The arrival of the still-forming bear, crying out with Cass’s remaining consciousness, reinforces what Lena has been seeing all around her. Death gives way to life, only it’s new, and changed. But this is not to suggest Annihilation is focused solely – or at all – on suicidal ideation. As Ventress says, this is distinct from what they’re doing, which is destroying who they were. The final sequence – almost wordless – is a marvel. Lena sees the end of Kane, only this may not be Kane at all. His questions – “Was I you? Were you me?” – and his unfamiliar accent point Lena toward the realisation that whoever he was and whatever their marriage was, that has gone. It has been destroyed, it has changed. The flashbacks we’ve now seen throughout the film stand not as connective tissue between the timelines, but isolated. We don’t evolve and grow as people during our lives, we change. We become somebody else. Ventress, underneath the lighthouse, knows that whatever the Shimmer is, it’s inside her. She doesn’t know what it wants, or if it wants. And then it emerges, first as a mandelbulb and then Lena’s shadow self, only unwanting and unaffected. Their confrontation – choreographed by dancer Bobbi Jene – is a dance. We understand Lena’s motivations to a degree: she wants to leave, but also wants to understand. But the figure, the other, cannot be read at all. It copies her in a way that could be the beginnings of comprehension, or communication, or aggression. It doesn’t want anything, it just is. Lena’s choice is then to either destroy herself, or begin again. They are possibly the same choice. The final chapter is an ending. The lighthouse is a destination. Annihilation is destruction. But out of this comes change, comes creation, comes a beginning. Lena reunites with Kane, but knows that he isn’t Kane anymore. Nor is she Lena. They cannot go back to their house in the suburbs, go back to their marriage, go back to them. We cannot return the world to an earlier state, or unbreak it. Toast can’t never be bread again. But if we take the long way round, find the back gate and climb into the garden, then maybe we can start something new.